If you were around in the 1980’s, you probably remember a small tabletop-size game called Connect 4. It was really popular as a new addition game that people had never seen before, and there have been many adaptations of Connect 4 since then. This giant outdoor game ECR4Kids Jumbo 4-To-Score Oversized Game is one of these, and it adds some interesting twists with lots of replay value. 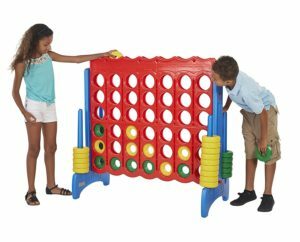 This giant outdoor game Jumbo Connect Four by ECR4Kids is expensive, but check out the size of it! The game itself is 4 feet tall and 4 feet wide, which makes for a totally new experience for kids used to playing with table sized board games. The object of the game is to be the first player or team to “connect” 4 rings in a row. Once a player or team does that, they’re declared the winner! Now, there’s tons of possibility for strategy in 4-To-Score, which can involve blocking opponent moves, thinking ahead, using speed and reflexes, and lots more. One of the best parts about 4-To-Score is the ability to add your own custom rules. For example, making a rule that you only have 5 seconds to make your move (drop the ring into a slot) guarantees fast-paced, exciting action. Or, forcing specific people to be your teammates when playing 4-To-Score in teams might force you to get better in the lesser (weaker) areas of your strategic abilities.